After D-Day, conducting routine patrols became a deadly game of cat and mouse for the 1st Infantry Division. Late in the evening on D-Day two German soldiers patrolled the outskirts of Colleville-sur-Mer, about one mile from Omaha Beach, and spotted Company C, 26th Infantry Regiment, 1st Division resting in a hedgerow field. Standing on opposite corners, the enemy unleashed machine-gun fire and killed seven Americans. The GIs struck back, killing one German; the other got away. 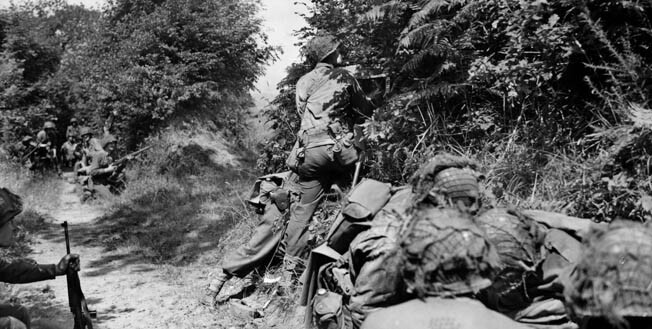 More than 200 soldiers, waylaid and bested by two, were introduced to the deceptive nature of hedgerow combat, standard procedure in Normandy during June 1944. Pushing inland, the 26th primarily encountered open fields, and from June 7 to 12 they marched 20 miles, plowed through moderate resistance, and bagged POWs. But deeper inland enemy-occupied hedgerows abounded, freezing the American momentum on June 13 at Caumont le Repas. Locked in a 30-day stalemate, the GIs soon discovered that the terrain fostered a glaring paradox. They could not see the Germans, but the Germans could see them. The hedgerows reduced visibility and precluded mobility, forcing both sides to exchange mortar fire and conduct reconnaissance patrols. GIs, combat veterans and raw recruits, however, did not receive any training in hedgerow warfare, making patrols a daunting task. Although Company C could not see the enemy, they could hear them. Hence, using their ears to navigate the meandering terrain, decipher sounds, locate German positions, and garner information, they learned about enemy combat tactics while coping with natural elements and persistent shelling in an odd, slowly paced battle. The patchwork of fields and hedgerows in Normandy. Never having encountered land that looked anything like Normandy, American soldiers had to understand its composition. Norman farmers, centuries prior, enclosed their fields with hedgerows to delineate property lines, slow land erosion from English Channel winds, and corral livestock. Hedgerows were composed of solid mounds of earth resembling parapets that surrounded individual land plots and were between three and 12 feet high and one and four feet thick. Growing on top were vines, brush, small trees, thorns, and brambles, which intertwined and grew into solid barriers, extending the height in some cases to 15 feet. The fields had different shapes, but on average were 400 yards long and 200 yards wide, giving the layout across northwestern France an asymmetrical appearance. Entrances to the fields were accessible via sunken lanes used for farm equipment and livestock. These were connected to other hedgerow fields and led to farmers’ houses, wagon trails, and roads. The terrain astounded soldiers because it even rendered tanks ineffective. Tanks could neither penetrate nor roll over hedgerows, and those that charged were blasted by panzerfausts, German shoulder-fired antitank weapons. Those bold enough to ride up the parapets exposed their lightly armored undersides, which gave the enemy large targets. Tanks could not maneuver down the narrow, sunken trails and were relegated to roads and open fields without hedgerows. The Germans organized an in-depth defense. Their positions were interconnected with wired communication and heavily manned with machine gunners, snipers, and explosive booby traps. The enemy’s primary tactic was preventing the Allies from gaining mobility, coordinating attacks, and enlarging their beachhead. Using the natural defenses of the hedgerows, they could achieve their objective by containment and engaging in virtually static combat. 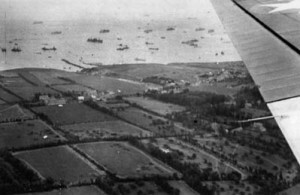 Allied senior commanders had been focused on putting troops ashore on D-Day and then linking the Allied beachheads together, but little attention was given to the difficult terrain advancing troops would encounter as they moved inland. Some staff officers even reasoned that the hedgerows would actually help the Allies to secure and maintain their beachheads against the enemy; they did not think their troops could become deadlocked in a costly battle of attrition. On June 11, General Clarence Huebner, commander of the 1st Division, issued Field Order No. 37, orders to assault the village of Caumont Le Repas in support of the offensive of the U.S. VII Corps, under General J. Lawton Collins, against the major port city of Cherbourg on the Cotentin Peninsula. The 26th Infantry would assail Caumont le Repas while the 18th Infantry struck five miles west in Caumont L’Evente and the 16th Infantry remained in reserve. Soon, however, German artillery rounds began falling on the farm, and the men of Company C started digging with renewed purpose. Pfc. Richard Crum recalled, “As we moved into position, a German armed patrol of some strength advanced to our front, and an intense fire fight took place.” The Americans held their ground against the German attack, which included small-arms and mortar fire on both the right and left flanks followed by probing assaults that swept toward the farm. The battle lasted almost 12 hours, and the 26th maintained their positons. At 10 pm, the Germans retreated south about 1,000 meters to higher ground across the valley, where they would remain for an entire month. The enemy units involved included elements of the 3rd Parachute Division and the vaunted 2nd SS Panzer Division, which according to the 1st Infantry Division’s G-2, was “one of the best units in the German Army. It fought with great distinction in the Polish, French and Balkan campaigns, and on the central Russian Front.” The GIs holding the line were unaware of these intelligence reports and knew little of the big picture. They did realize they would have to learn to fight in the unfamiliar terrain by trial and error. The valley separating the armies served as an immediate test to Company C’s adaptability. A four-man reconnaissance patrol left camp at midnight on June 14 and found open fields, hedgerow fields, and wagon trails along the valley floor. The men became confused and disoriented. After being challenged and fired on, they headed southeast, deeper into enemy territory where they observed infantrymen in the forest. At dawn they went northeast toward the British Second Army’s sector. They returned to camp after nearly 19 hours on patrol. The GIs had been surrounded by hedgerows, which, in some instances, skewed their bearing to the point that when looking at a map they could not ascertain their own location. Improvising when lost, however, was expected duty of any GI. Pfc. Rocco Moretto recalled a four-man night patrol on June 21 that was cut in half, leaving two soldiers without a map. Lieutenant Emory Jones and Sergeant Thomas Shea led the patrol, and Moretto and Pfc. Kenneth Miller brought up the rear as “getaway men.” If anything went awry, they were to head back to camp and report. As they reconnoitered the “route and condition” of a nearby stream, the four men walked down the valley, stayed on trails, bypassed hedgerow fields, then went across an open field. After Shea and Jones returned to camp, Moretto learned that the other patrol had actually been from the 1st Division’s 3rd Battalion. The hedgerows and thick vegetation restricted visibility, and darkness had made it almost impossible to detect movement. Neither Moretto nor Miller could call out to Shea and Jones, lest the Germans hear. Patrols often received machine-gun fire when approaching enemy-occupied hedgerows, outposts, and houses, but they had difficulty pinpointing the actual location of the enemy. Most patrols went out after sunset, obviated attention with basic precautions, and did not talk. They did not smoke because lit cigarettes revealed positions. Steel helmets sometimes reflected moonlight. GIs on daylight patrols had to exercise extreme caution, not only near hedgerows but also in open fields. Furthermore, their olive drab uniforms, even the undershirts, drawers, and socks, were chemically treated (to protect against gas attacks) and 100 percent wool. The June heat caused perspiration and produced conspicuous white spots and streaks on their uniforms, making them easier for the enemy to see through field glasses against the verdant landscape. German soldiers, on the other hand, were seldom visual targets but frequently audible ones. GIs slowly walked through the sunken lanes listening for signs of the enemy, which left one option for immediate offensive action—fire through the thick hedges. Sergeant Russell Werme, a sniper in C Company, remembered, “I always aimed for the head in Sicily and North Africa, but in Caumont I didn’t get that chance.” Company C was a rifle company, and its only offensive action, shooting blind through hedges, spawned frustration. The terrain, though, dictated their actions, and on patrols GIs learned to listen for enemy activity. 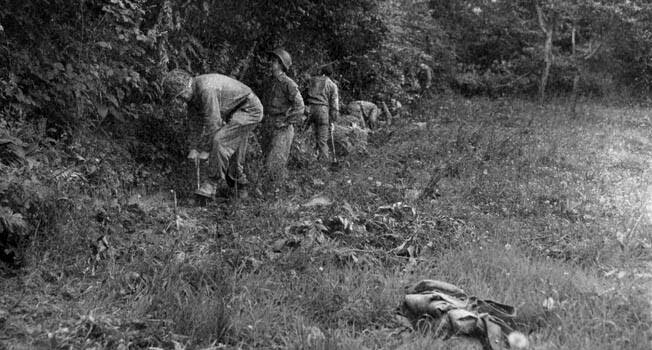 American soldiers dig in along the edge of a hedgerow. The Americans learned quickly to dig in and hug the hedgerows when enemy shelling began. About 6:30 am, Captain Ferry learned that the patrol was pinned down and deployed reinforcements, but they could not penetrate the enemy’s stalwart defense. Lieutenant Marlin Brockette remembered that Werme was stuck “in no-man’s land between the armies.” Almost eight hours later Ferry heard that Werme’s patrol had men wounded and reported it to Lt. Col. Francis Murdoch, his battalion commander. At 10:10 pm, Murdoch ordered a platoon from C Company under a smokescreen and covering artillery fire to bring back the injured soldiers. The platoon retrieved them. Werme was evacuated to a hospital. He lost two ribs and never returned to action. Carey and Brehm were dead. Entering one of the sunken lanes between hedgerows was like walking into a dark tunnel, and the thick foliage impeded visibility. In the ditches flanking the trails, snipers dug slit trenches for concealment and protection against Allied mortar and artillery fire. Some dug so deep that they maintained well-stocked pantries and wine cellars. Cloaked by the vegetation the enemy set antipersonnel mines that were often undetectable. “Those lanes scared the hell out of me,” recalled Pfc. Moretto. “You really had to take your time and be vigilant.” But sometimes that was not enough. During a patrol on June 28, Pfc. Tauno “Jack” LePisto walked along a trail next to a hedgerow and stepped on a mine. He lost a leg and died from the wound two days later. Securing information was an integral part of a patrol’s task. Noting the coordinates of the enemy’s mortar and machine-gun positions was crucial in directing effective artillery fire. Although G-2 reported, “From 17 June on, it became increasingly difficult for our patrols to penetrate the enemy lines,” GIs found a way. On June 29, engineers removed “four enemy AP mines From N side of trail to West of hedge.” And a Company C patrol reported on June 22 that “6 or 7 Germans moved out of mortar and MG positions” that were “fired on by 81 mm mortar” from GIs in Company D.
The most coveted information source, perhaps, was a German soldier; but, the hedgerows made it difficult to nab a prisoner. During the first week of the Normandy Campaign, the 26th Infantry captured more than 90 German soldiers, finding useful documents that helped intelligence personnel determine the locations of enemy units. In Caumont le Repas, however, enemy prisoners were scarce. From June 23-25, 1st Lt. C.A. Lafley, the 26th Infantry intelligence officer, sent messages to Companies A, B, and C that “a POW would still be highly appreciated.” No records indicate C Company captured an enemy soldier. Cattle, living and dead, were abundant across Normandy and delivered vital information in their own right. A dead cow cautioned that a field or trail might contain mines and acted as a landmark, giving GIs a sense of direction in the confusing twists and turns. Grazing cows were often a sign that an area was free of mines. American and German soldiers monitored the behavior of cattle. Those that stared at a hedge might be indicating that an enemy soldier was hiding in or near it. On June 22, a Company C patrol experienced a rarity, a direct contact fire fight with the enemy. It started as a routine reconnaissance patrol. Soon enough, the Americans noticed a tripwire on a trail and recorded the coordinates. Then they came across a German patrol estimated to be of platoon strength and killed three enemy soldiers who were armed with machine pistols and hand grenades. As dawn approached, the Company C patrol withdrew. They did not suffer any casualties but could not sustain the fight. As the GIs headed back to camp the Germans followed, stopping their pursuit about 200 yards from the company’s outpost and opening up with machine-gun fire on the left flank. The Germans, however, found the GIs with ease. They defended Caumont le Repas before being pushed back on June 13 and knew the lay of the land. They usually held high ground and scanned the farmsteads and fields with binoculars. The days were long, usually with the first streaks of the sun appearing as early as 4 amand the last rays sinking in the west around 8:30 pm. The Germans watched houses, barns, foxholes, a nearby apple orchard enclosed by a hedgerow, and American soldiers. The enemy probed often as patrols fired at the outposts but were unable to penetrate the farm. Artillery, though, was another matter. Groden and Schmidt were killed. They were located where most of Company C’s foxholes were, in an L formation bordering the road to Caumont L’Evente, and they provided the enemy with conspicuous targets. Taking protection from mortar fire in their foxholes, GIs either sat down or curled up. Pfc. Edgar Smith learned a valuable lesson the first day in Caumont le Repas when he stood up after digging a three-foot hole. He recalled, “When those shells hit I was literally thrown backwards out of my foxhole and landed a few feet away. I got back, sat down, and didn’t dare make that mistake again.” The high-pitched sound of an enemy mortar shell, which Cameron referred to as a “death whistle,” evoked an ominous, restive feeling and forced GIs to dig deeper. They also covered their foxholes with heavy branches and reinforced the walls and top edges with sandbags. Shrapnel ripped into several soldiers in C Company, who were out of their protective hovels during the 30-day battle. On June 15, the 26th endured a particularly savage attack. The Germans unleashed a frenetic onslaught of shells, knocking out C Company’s communication to battalion headquarters. Moretto recalled, “Captain Ferry gave me an order to run to Battalion HQ, and let Colonel Murdoch know that we lost radio contact and that the Captain was expecting a counterattack.” As Moretto headed west he found six wounded men sprawled on the ground. Sergeant George Finfrock, who led the 60 mm mortar section in the weapons platoon, looked the worst with blood gushing out of his right leg. A piece of shrapnel had torn into his upper thigh. Moretto remembered, “He wasn’t conscious. I ripped his pant leg, took out my medic pack, sprinkled sulfa powder on the wound and wrapped it tight. Then, I carried him to his foxhole and headed to Battalion HQ to deliver the message to the colonel.” Finfrock was evacuated to a field hospital and later said that Moretto saved his life. Enemy artillery caused the most U.S. casualties, about 75 percent, in the Normandy Campaign. Pfc. Everett Hunt recalled, “All of us young soldiers had questions about the best place to be when the enemy fired their .88 shells. They [old soldiers] would give us textbook advice like dig away from trees to avoid shrapnel.” Old soldiers also warned against hiding behind anything standing on the farm. Pfc. Peckham remembered, “I got that advice, but when shells started blasting I ran for cover, and the only thing close was a stone shed.” An explosion crumbled the shed onto his legs. Suffering severe bruises and unable to walk, he was evacuated to a hospital. 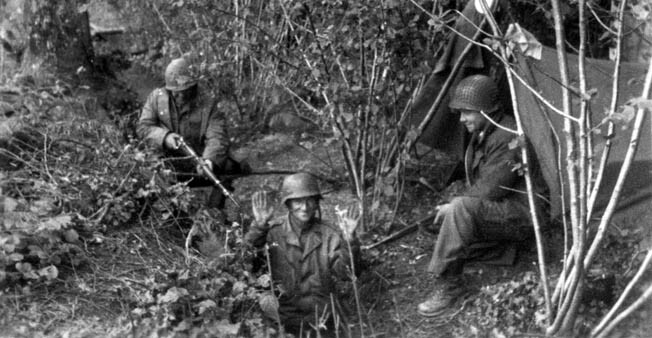 American soldiers appear to have staged the mock capture of a German. Although the 26th Infantry Regiment’s intelligence officers requested that GIs capture German soldiers for interrogation, the hedgerow country made grabbing them a difficult proposition. Although young soldiers followed the lead and direction of the old, hedgerows were an equalizer. Experience levels were sometimes meaningless amid them. Together, American soldiers learned how to navigate the meandering labyrinths, maintain their sense of direction, and detect enemy camouflage and booby traps. Patrolling the hedgerows, Company C scored victories and suffered losses in Caumont le Repas. Their missions were fraught with peril and required patient, methodical movement through one field at a time. Blades welded on a tank to push through the hedgerows. Normandy’s terrain was the bane of General Bradley’s existence, and an enterprising GI helped cope with the challenges of the hedgerows. 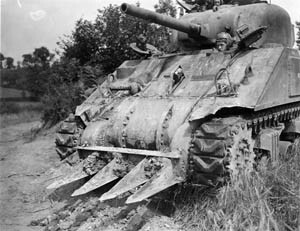 In early July, Sergeant Curtis G. Cullin, Jr., of the 102nd Calvary Reconnaissance Squadron formed scrap iron from an enemy roadblock into hooked blades and welded them to a tank’s forward hull. The blades sliced through the mounds and then plowed with ease across the hedgerows. The tanks were dubbed “rhino tanks.” Bradley observed a demonstration in mid-July and then ordered the cutting devices placed on as many tanks as possible. On July 13, 1944, the 26th Infantry Regiment was relieved by the 11th Infantry Regiment, 5th Division and marched out of Caumont le Repas. The experience the men of Company C acquired would serve them well in phase two of the Normandy Campaign, when they would face more hedgerow combat near the embattled city of St. Lo. First-time contributor Scott Bryan conducted extensive research in the preparation of this article. He resides in Brooklyn, New York. Tags 1st Infantry Division, Africa, after d-day, Allies, American, Americans, army, artillery, blades, British, calvary, Camouflage, Cherbourg, CIA, D-Day, EAM, English Channel, France, French, general, General Omar Bradley, German, german paratroopers, Germans, Hand Grenade, hedgerow, machine gun, Mary, Monitor, Mortar, New York, Normandy, normandy campaign, north africa, omaha, omaha beach, OSS, Panzer, Panzerfaust, paratrooper, Paratroopers, Polish, POW, POWs, radio, Rhino tank, Russia, Russian Front, sam, Schmidt, Sicily, Sniper, Squad, Tanks, Tern, the Cotentin Peninsula, Thor, Tory, US Army, weapons, WIN, wounded, WWII History June 2017.